Possibly one of the best PlayStation 4 games to surprise people this year is horror game Until Dawn. While it wasn’t an open world game or had elaborate set pieces, it still managed to captivate gamers with its compelling story, giving the player choice on the narrative, and just a fresh experience compared to most games available on the console today. PlayStation LifeStyle recently had the chance to talk to Supermassive Games Executive Producer Pete Samuels about the development of Until Dawn, its sales success, and even about a sequel. PlayStation LifeStyle: When did Sony come to you and say the game (Until Dawn) needed to be overhauled as a PS3 Move title to PS4? What was that conversation like? Pete Samuels: When the discussion happened it was something that we’d already been contemplating, knowing that the PS4 announcement was coming soon and having received a lot of community feedback about making a non-Move version. It made immediate sense, so it wasn’t a long initial conversation. The ‘how’ was a longer one, although we did all get on the same page quite quickly. From the outset we were all really enthusiastic about what Until Dawn could be on the PS4 and there was never any doubt about it being the right thing to do. PSLS: Leading up to release, what were your thoughts on Sony’s marketing for the game — a question we asked Shuhei Yoshida as well. Did Supermassive feel that it wasn’t being marketed as heavily as other first-party exclusives? Samuels: If a game is quite different to what’s come before, it must be difficult to know exactly what to do, who to aim the marketing at, and what the message should be. Even if the strength of the push wasn’t as big as we’d have liked, there was a huge amount of creativity in the way that Sony promoted Until Dawn. We’re delighted with the consumer response though. It’s so important to us to get that validation that the new things we tried resonated with a large audience, and we’re looking forward to the ‘additional marketing push’ that Shuhei mentioned to sustain the momentum. PSLS: How good would the game have been if launched as a PlayStation Move title as compared to the final product? Samuels: I don’t doubt that it would have been a great PlayStation Move title on the PS3, but moving to PlayStation 4 granted us the opportunity, through time, budget and technology, to reimagine Until Dawn as a ‘play-your-own-horror-movie’ game, and in that sense make something far more original with a broader appeal for a more grown-up audience. PSLS: Did PlayStation VR (Morpheus) come up during development? Should we expect an Until Dawn PS VR edition anytime soon? Samuels: PlayStation VR cropped up in conversation a few times during development but no, we don’t expect that there’ll be an edition of the Until Dawn story to be playable in VR anytime soon. Not unless somebody has a sudden rush of blood! PSLS: This is the closest thing to playing an actual movie most people will have experienced. How did capturing such a realistic performance impact development both technically and from an acting talent perspective? Samuels: It was a technical challenge that we were determined to overcome from the outset. Not just to deliver realistic performance within a game but to do it in runtime, consistently, rather than relegate it to pre-canned non-interactive FMV sequences. We were striving for constant immersion and character believability, and the feedback we’ve had suggests that we largely achieved that. From an acting talent perspective it was pretty much the same as shooting an actual movie and we treated it that way, drafting in an experienced film production crew for every shoot. Without having the on-set film-production concerns of cameras, lighting and set-changes we were able to shoot scenes as quite a rate though. It was fairly taxing for the actors but they all did an incredible job. PSLS: Have you given any thought to what other stories/genres you would want to tell in a similar way to Until Dawn? Samuels: The first question for us was “what is ‘a similar way to Until Dawn’?” There’s obviously a lot going on in the game, and we’re not so arrogant to assume that everything we’ve done is perfect. Distilling the essence of the key things in the storytelling that have generated the great reception was the first job for us. Now that we believe we’ve done that as best we can, with a huge amount of help from the press and player feedback, we are working on building on these strengths and eliminating anything we see as a flaw. We’re now applying all of that to a new project, and that’s very exciting. PSLS: Will they ever release a map or graph showing exactly which decisions actually impact which large scale outcomes? Samuels: We tried a number of things during development in an effort to represent this to the player. Much of what we came up with was just too complicated to read, because so many things affect the many ways in which the story plays out. It always looked like a massive and illegible spider’s web. In the end we broke it down to the Butterfly Screen which, whilst not painting the entire picture, at least informs the player fairly clearly of the chain-of-events and major consequences of the bigger decisions. We’ve seen maps published by players for shorter sections of the game, and some have been very accurate. Those that have tried will probably realize the likely complexity of a single map that represents the decisions leading to all large scale outcomes in the game. PSLS: Are they any hidden outcomes or paths in the game that players have yet to discover? Samuels: There are so many detailed events that depend on what the player chooses to do that it’s impossible for us to track what everyone has done, although we see so many reports of people doing their 3rd, 4th, 5th playthroughs that I doubt there are many stones left completely unturned. There are some interesting forums filled with ‘have you seen this?’ and ‘oh my god I’m on my 4th playthrough and I’ve never seen that’. All of this gives us great confidence that our team’s attention to detail has really paid off. PSLS: Until Dawn has been widely praised so I think it’s safe to say it was a surprise hit for a lot of us. Are there any plans for DLC or expansions for fans? Samuels: The underlying ‘truths’ in the story are pretty sacred. If an expansion of any kind required us to change a truth then we wouldn’t be happy doing it. We get asked a lot for a happy-ending for one character in particular. We can’t see how that could work without breaking some important truths. I’m not ruling out DLC, we just haven’t yet found the right context for it. PSLS: What was your favorite gruesome death in Until Dawn? Samuels: Probably the Matt-Face-Punch. He’s such a nice guy. Impossible to dislike. And the manner of that death is quite a shock for most people. PSLS: Besides Walking with Dinosaurs, Supermassive Games’ last major title, before Until Dawn, was Doctor Who: The Eternity Clock. Until Dawn is of a much higher quality, compared to your 2012 offering. What went wrong there, and what went right with Until Dawn, because clearly, Supermassive Games has a talented staff. Samuels: We have very talented staff, there’s no doubt about that and you’re right, Until Dawn is testament to that talent. Absolutely honestly? In addition to the talented team, Until Dawn had the right budget and development time. The goals were set incredibly high from the outset and were always clear, and Sony XDEV did a great job in supporting us throughout development. Lots of things went right with Until Dawn, including us just ‘getting better’ at our own internal quality assessment and development management, and growing in confidence to push the game in the way that we felt would work best. For a big team we’re still a relatively new team, when you compare us to other studios making games of a similar scale. We’ve made mistakes but we’ve come a very long way very quickly, and we’re not done improving. 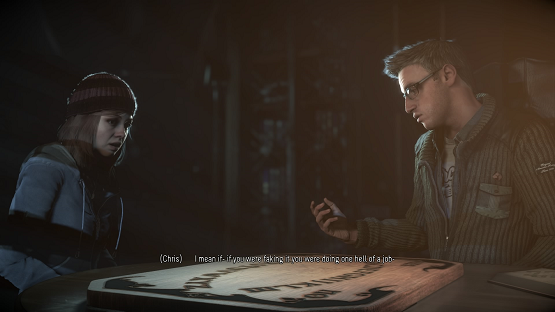 PSLS: Until Dawn has become a streaming phenomenon, but has that translated into sales? Plenty of people are watching full playthroughs of the title, but are they buying it afterwards? Samuels: I believe that it’s translating into sales. It must be. I think that if it was a linear story the impact on sales would be less, but I do believe that there are people watching the choices that others are making and wanting to get hands on to make their own choices and see a different story play out, and that this has had a positive effect on sales. It’s arguably the best marketing the game has had, because it’s predominantly people showing an honest and enthusiastic appreciation for the game. PSLS: Are “Let’s Plays” frustrating when you are building such a cinematic and narrative-driven game? Samuels: Not at all. We’re really happy to see people enjoying what we’ve made. That’s not to say that it isn’t an issue facing the industry for the future, and one that we all need to find a way to get comfortable with. Clearly, people doing this with film would create significant problems for the film industry. We need to make sure that there are enough reasons to buy the game even having watched a Let’s Play and it’s something that we’ll pay even more attention to in the design of our or next game. I’d be frustrated if we’d made something that people weren’t interested in, and there were no Let’s Plays! PSLS: How is Until Dawn doing sales wise? Is it performing as expected? Better? We saw it do well in sales data, which a lot of people were surprised with. Samuels: It’s definitely surpassed expectations. I think that’s already been stated in other interviews, and reports of significant retail outlets running out of stock during the first weeks after release kind of supports that. Samuels: I think that you should expect the team to build on what we’ve done with Until Dawn, whether it’s in horror or in other genres. We’re already working on one thing that does that, whilst exploring other avenues for our other teams in anticipation of them finishing their current projects. We do talk internally about what Until Dawn 2 could be, as it clearly can’t be a sequel in the traditional sense, with the same characters facing the same threat, not least of which because in different stories some or all of them are already dead! We’ve investigated other ways we could do Until Dawn 2 but it probably is a little early to be discussing that. PSLS: On that note, what does Supermassive think of an anthology theme for Until Dawn? Say, having the same cast of actors but in a different story, setting and roles? Samuels: This is one of many suggestions that fans of Until Dawn have been tweeting. As I’ve said, we do listen carefully to the feedback from fans and always consider how that should influence what we do. I’ve also said that we’re already working on our next thing but we’re not ready to talk about that just yet. We’d like to thank Supermassive Games for our in-depth chat and answering our questions as candid as possible.